It is easy to see whey the attractive market town of Keswick in the Lake District has been attracting visitors and inspiring poets, writers and artists for generations. Idyllically situated at the tip of Derwent Water and under the majestic fells of Skiddaw and Blencathra. Keswick is perfectly situated for exploring the Northern Lakes. The valleys surrounding Keswick have a strong mining history for copper, slate at Honister Slate mine and perhaps, most famously, the graphite discovered in Borrowdale around 1550. Derwent Pencils are renowned for their quality and the Pencil Museum in Keswick will lead you through how they lay claim to the manufacture of the world's first graphite pencil as well as other interesting local history. The museum is temporarily being refurbished, check here for opening times/dates. A monument to the Poet Laureate Southey with an inscription by Williams Wordsworth can to be found inside Crosthwaite (St. Kentigern's) Parish Church. Southey is buried in the churchyard near the north side of the tower. 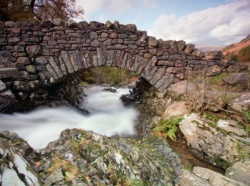 A walk past the famous Cumbria Bridge, Ashness Bridge, and to the 'Surprise View' view point can neatly be combined with a trip on the Derwent Launch. Find Derwent Launch/Walk details here. The Keswick Launch company offers a great variety of boating activities. Combine lake cruises with walks, or take out a self drive or rowing boat or just simply relax on a cruise around the Lake. Access to this National Trust property depends on lake levels, because of this tickets are normally only sold three days in advance. Admission is by timed-ticket and there is also a children's self-guided tour around the island. Note that there are no public w.c. facilities on the island. For more information on opening times here is the National Trust website. The Keswick Theatre is an absolute treasure. Professional, performances in a very friendly theatre. What's more there is a car park right outside the door. The cafe at Theatre by the Lake is perfect for pre-show lunch or dinner (booking is normally necessary). From the Theatre there is a gentle stroll down to Derwent Water. Find out What's On at The Keswick Theatre here. There are many beautiful walks around the fells of Keswick. From the heights of Skiddaaw and Blencathra, to more leisurely saunters around the Castlerigg ancient circle of stones. Find free downloadable walks around the Keswick Area here. Locals and visitors alike flock to arguably the best takeaway sandwich shop in Keswick. Recently under new ownership Jan has taken Lakeland Sandwich & Pie shop to a whole new level. If you are in a rush then orders can be phoned ahead - or pop in and look at the delectable range - you even have the option to make up your own specialty sandwich if you like. The Filling Station on the outskirts of town definitely needs a mention too. This isn't just a 'bikers' cafe - if you have kids/teenagers or biking enthusiasts in the family they will love the Filling station which its retro coffee shop come American diner biker theme. Oh thinking of teenagers it has WiFi too! Food is good here and freshly prepared, all day every day, which is why regulars are just as likely to be walkers, cyclists and locals as they are to be clasping their bikers helmets. Kudos to their well prepared menu, they were finalists in the 2013 & 2015 Cumbria Food & Drink Awards. Enthusiasts will be cheered to know that there is more to the Filling Station than just looking at memorabilia. Brysons of Keswick has been a market square attraction, in Keswick, for as long as I can remember. As you'll have guessed by now, I'm not a particular fan of large dining areas so their cafe area isn't, if you'll excuse the pun, quite my cup of tea. However, the ground floor is quite an Aladdin's cavern of home-made eateries and it is hard not to be drawn in, for at least one purchase. At Christmas their Santa gingerbread men are very hard to ignore! A beautiful selection of holiday cottage accommodation available in Keswick and the surrounding villages. Keswick, and in particular, Greta Hall, became the literary hub for some of the most famous authors, poets and writers from Britain. Poet Laureate Robert Southey and his wife Edith who made their home at Greta Hall for over 40 years. Beatrix Potter was also a regular visitor to Keswick taking holidays at Lingholm and Fawe Park. These stately homes front onto Derwent Water and inspired many of her stories.